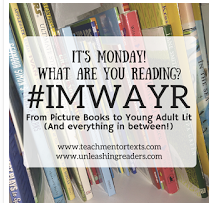 Today I am truly doubling up my Slice of Life post with my Monday Reading post. 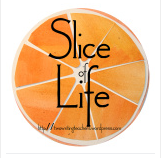 The Slice of Life Challenge is hosted by the inspirational writers of Two Writing Teachers. Each March, they invite people to join them in a commitment to write every day. Today, I am doubling up on my slices with my Monday reading. Jen Vincent at Teach Mentor Texts and Kellee Moye and Ricki Ginsburg at Unleashing Readers cohost It's Monday! What are You Reading? weekly on their blogs. To see what others are reading and recommending each Monday, or to participate, be sure to head over to these blogs. Over the week, the majority of my reading life has been reading blogs within the Slice of Life community. Yes, I have read several picture books--I struggle to walk by the library shelf of featured ones. I also had a wonderful time reading Encounter by Jane Yolen to a group of fifth graders, issuing them a challenge to generate their own questions. (If you've never read Encounter, go get your hands on a copy.) I also did some reading about Alzheimer's Disease and dementia to support my daughter as she tries to complete her Senior Capstone Project. (Wouldn't be my top choice for my reading life!) But, mostly, and happily, my reading life has been about sharing the daily lives and posts of the amazing community within the Slice of Life. 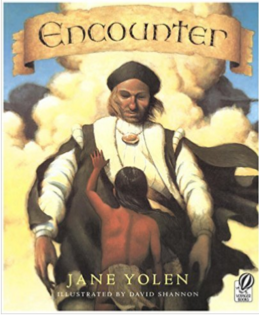 I love Encounter and read it to my fifth graders every year when we study explorers. It's such an excellent mentor text! Another great Jane Yolen book. Fun to hear about your eclectic reading life. Thank you Melanie - I am honored and touched. This community has given me space to think through the many thoughts and feelings I am having or have had over the past five years. It has amazed me how many people are connecting with this topic. It does seem to be universal. I loved your piece yesterday - I felt and connected with so many moments in that piece. Thank you for sharing your heart and response with me. Clare's post is so beautiful and worth sharing twice! I have been reading so many SOL posts that I haven't read as much as usual in book format but am so enjoying all of these refelective posts. Thanks for sending me to Clare's post. I usually have read her posts, but the weekend kept me from reading so many. This is what I wrote to her, & it is to you, also, knowing your own life's challenges. I cared for my husband for five years before he passed away & I would never have survived without the help of so many many people, including my family, and those very close, my son & daughter-in-law, my daughter & son-in-law, and even the (at the time) two grandchildren. For those who care for someone with dementia, the grieving begins before death, what I often called the longest goodbye. There are many positive moments in grief. Clare's list tells us how it really is.